Today I’m chatting with Wilnona Marie about her women’s fiction novel, And I Thought Divorce Was Bad: With Other Life Lessons. Welcome, Wilnona. Please tell us a little bit about yourself. I started writing when I was seven years old. Hence, later I say I wanted to be a doctor when I grew up then a writer. I wanted to be a doctor when I was five, so it’s a chronological list. Anyway, I’ve been writing since then. I was first published when I was seventeen. I still have the literary magazine, it’s a little tattered now. I took a hiatus during marriage. After I wrote my name on the divorce papers the ink just kept right writing through three more novels and three series. The book is setup as life lessons. Each of the five authors has there say in the section. Really the book is a conversation with the reader about heartbreak, the pain it causes, and learning to accept who you in the aftermath of a normal or abusive relationship. I don’t think any of the authors complete their journey, but they begin to accept where and who they have become. I was with my sister one day driving along and I was telling her another story about an awful date. She said I should write the stories in a book, because they are unbelievable. I took her advice with a grain of salt and continued on with my story. My sister was silent so I asked if she is listening. 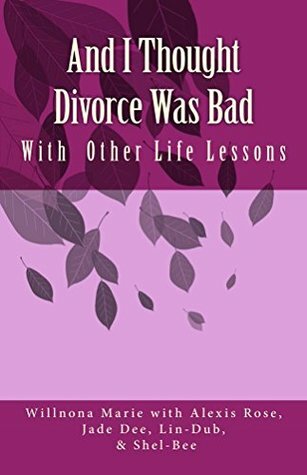 Her response was yes, but she added, "You should call the book And I Thought Divorce Was Bad, because your divorce was bad but what happened after was worse." That was the birth of the book. I plan on revisiting my first series. I just finished Widow’s Debt vol.1 and it is at the editor’s office. What I am currently writing is a romance novel with another author, Jess. I run my own business, assist in the day to day operations in a friend’s small business, and volunteer within the deaf community. I always find time to write, because it is more of a compulsion than hobby. When I wake up I think about breakfast, exercise, and what my characters will do today. A way to jot or type something down is with me at all times. If writing my novels by hand isn’t quirky enough I tend to start at the end of a notebook and write towards the front. A doctor or a writer. Thanks for reading the book or checking out this interview. I would love to hear from any readers. I love the feedback and not just in reviews. Please e-mail andithoughtdivorcewasbad@yahoo.com (yes I’m exceedingly old school), or hit me up on Facebook or on Goodreads. Can’t wait to hear from you. Thanks for being here today, Wilnona!